From the arts to technology to healthcare and so much more—see what you can be at CCBC! View our locations, shuttle services, MTA services, CCBC at BCPS locations, campus maps and directions. 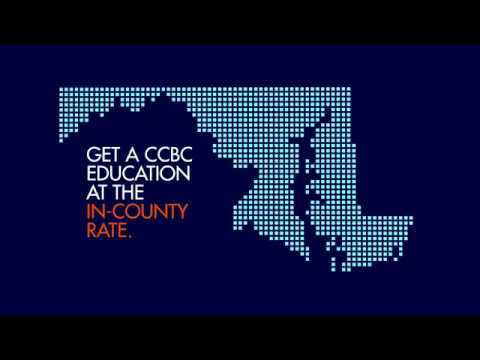 Why choose CCBC? We promote lifelong learning, workforce development, and cultural enrichment, all at an incredible value. CCBC has over 60 years of academic excellence to offer you in addition to small class sizes, a wide variety of programs and certificates and personal contact with your instructors. We also have an active campus life involving athletics, performing arts, clubs and a ton of resources to help you along the way. The college is always changing and growing - whether it’s new degree programs, improved buildings or new services. We’re here to help you succeed and achieve your goal - whatever that may be! Are you a high school student about to start your college journey? Or maybe you are an adult learner who wants to earn their GED or desire a career change? Perhaps you started college somewhere else and want to further your education with CCBC - you can get credit for what you already know! We also have options for kids and seniors. No matter where you are in life, CCBC has the tools to help you excel. Placement testing. Do you need it? Interested in learning online? We have class for that! Get off to a smart start! After you apply, register for a new student orientation. You decided to go to college, but aren’t sure how you’ll pay for it. At CCBC, we have options that students take advantage of everyday to help with the bill. Get a rough idea on your overall cost of attendance using our net price calculator. What is it and am I eligible? While you word hard on your academics, see what else CCBC has to offer for fun and activities. See a show, dance or music performance. Check out our art galleries. Join an athletic team or come to a game. See what clubs we have. Join or start a new one! Learn more about the Male Student Success Initiative. What to expect during your first year. Meet with a mentor or become one! Get involved in your community. We have a variety of service opportunities for you to join. Check out the Newsroom for all the latest CCBC news. We offer Global Education programs as well as study abroad opportunities. Need a ride? Use our shuttle service to get you from campus to campus. Stay safe on campus. Learn more about our Public Safety officers, what they do, where they are located, how to contact and additional safety tips. Questions? Contact us for more information about all of our student life activities. What does CCBC have in store you you? Take a tour of our campuses and see what you can be! Our #1 priority at CCBC is you! We have lots of tools and services to help you along the way. Prior Learning Assessment. Get credit for what you already know. Developmental education. What courses will work better for you? Joining our Honors Program. Learn about the benefits and requirements. CCBC maintains an open door policy for general admission and welcomes all who can benefit from the learning experience.